In the Good Old Summertime, a 1949 musical/romance directed by Robert Z. Leonard for MGM. Andrew and Veronica are instant enemies from the day they meet. When Veronica is hired as a saleswoman at Oberkugen’s, a music store where Andrew also works, their dislike for each other continues to grow. But while they may hate each other in their in-person interactions, what they don’t realize is that they’ve been writing sweet letters to each other anonymously as pen pals. Keaton’s first appearance in an MGM film since his firing in the early 1930s. He was hired on as Hickey after coming up with the brilliant fall that breaks the violin. The studio realized that he would be the only person who could pull off the fall believably. Frank Sinatra, June Allyson, Peter Lawford, Gene Kelly and Gloria DeHaven were all considered for Andrew and Veronica before the roles went to Van and Judy. 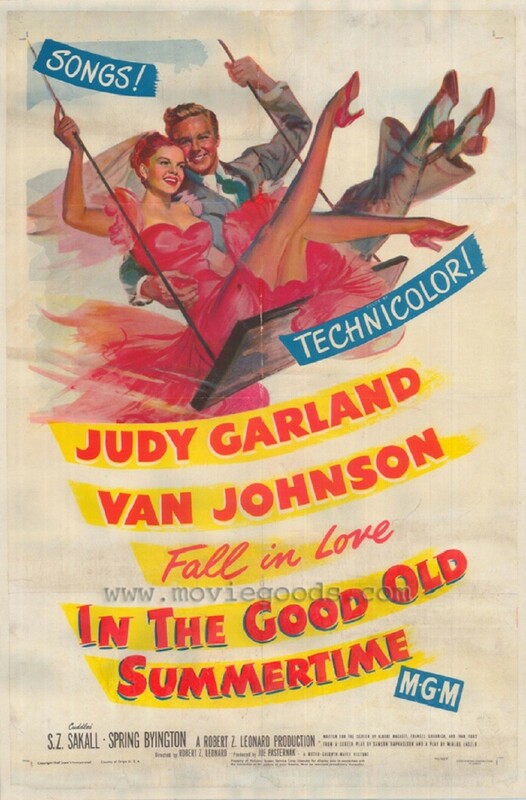 This was one of Judy Garland’s final films with MGM. Judy, Buster and S.Z. alone are reason enough for me to watch and love this, but the whole cast is so wonderful! Andy throwing his flower and going into the restaurant to trick Veronica. There’s just something magical about Judy’s musicals, and this one is no exception. See what I learn when I visit your site? I never knew there was more than one remake of ‘The Shop Around the Corner’! I kinda liked the first one, never did see the Hanks-Ryan version, and now I’ll have to check this one out when (wait for it! )…I sign up for Netflix Streaming. I love that last quote from Judy you listed above…that and that crazy GIF alone are enough to convince someone to watch the movie! The Hanks-Ryan one and this version are both worth watching. You’ve Got Mail is one of my favorite “newer” (as in, was released after I was born haha) romantic films. Nora Ephron did a fantastic job adapting the story to modern times. Both now added to my NS list! And I’m at this moment watching ‘Die Hard’…another great romance drama from Nora Ephron! What a different movie it would have been if they had gone with a different cast. It is such a classic it’s unimaginable to consider it beung any different. Completely agree! I’m not sure it would have been so great without this cast. Judy is just perfect in this.